We’re expanding our space with more private offices and new dedicated desks! Want to save yours? Reserve a dedicated desk or office for only $150 now and receive unlimited coworking until the desk or office is ready. Plus save 50% off meeting room hours! Contact us now for more information. Transform the way you work with WORKZONES in Santa Barbara! Have you ever considered coworking in Santa Barbara or renting a professional office space? With WORKZONES, you can enjoy an energizing and engaging community that allows you to network with like-minded individuals. For individuals, teams, and startups, WORKZONES offers the perfect office space in Santa Barbara for all of your individual and team needs. Why Rent a Private Office? When you have a business, it’s preferable to work in a professional setting; however, you may only need an office space for a short period of time, or you may not want to sign a long-term lease. WORKZONES provides monthly private office leases which gives you the flexibility you need to enjoy the benefits of working in an office without the long-term commitment. Our private offices are perfect for startups and teams ready to work in a professional setting! We provide a private office package, also known as the OFFICEZONE, that includes a furnished office, utilities, fast and secure wi-fi, mail, printing and scanning, hosted business hours, and complimentary coffee and tea. Additionally, our OFFICEZONE membership includes access to the coworking space, which gives you and your team room to stretch out. Enjoy the camaraderie and culture of working in a shared office space with other entrepreneurs and teams. Coworking in Santa Barbara can surround your business with like-minded professionals who could boost your team’s creativity and provide your company with invaluable input. At WORKZONES’, we provide our customers with convenient, 75-minute free parking at the mall. There is also some off-street parking and other city lots near our location. Please note that some of the city lots have monthly parking passes available. Ask our team about discounted monthly parking passes as an add on service to your office package. Are you interested in renting a private office? 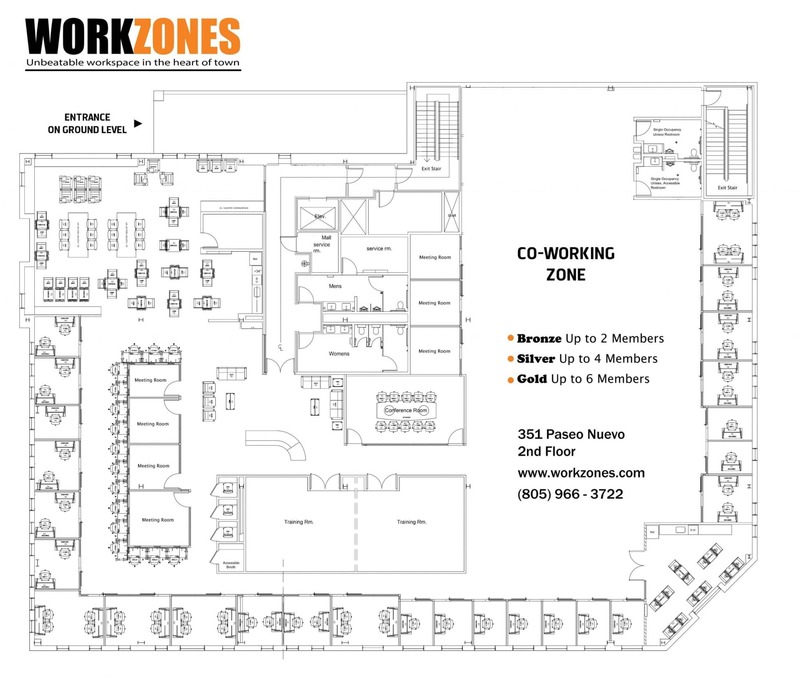 To get more information about our OFFICEZONE plans or to schedule a tour, call us at 805-966-3722 or contact host@workzones.com today!